CLEVELAND - In a sweeping speech about upward mobility in the United States, Republican vice presidential candidate Paul Ryan laid out a vision in which public assistance would be measured by outcomes and not by how much the government spends. While Ryan did not offer any specific new initiatives, the speech was a way to show concern for the social safety net and perhaps reach out to voters alienated by nominee Mitt Romney's secretly-recorded remarks about the 47 percent of people who don't pay income taxes. Some voters may also have reservations about the budget Ryan wrote for House Republicans aimed at shoring up the finances of Medicare and other entitlement programs. While Ryan insisted his party has a vision for strengthening communities, he said, "we don't always do a good job of laying out that vision." But he also argued that President Obama and the Democrats have been unsuccessful in fighting poverty. "In this war on poverty, poverty is winning," Ryan told about 600 people at Cleveland State University. "We deserve better. We deserve a clear choice for a brighter future. ... With a few exceptions, government's approach has been to spend lots of money on centralized, bureaucratic, top-down anti-poverty programs." He highlighted the 1996 welfare reform law as a model for helping lift people to the middle class, but said that in many other anti-poverty programs "we're still trying to measure compassion by how much government spends, not by how many people we help escape from poverty." Democrats have charged that the big spending cuts in Ryan's budget would hit low- and middle-class Americans the hardest by slashing funding for health and nutrition programs, education spending, and tax deductions that benefit the middle class. "Congressman Ryan's speech today existed in an alternate universe," said Obama campaign spokesman Danny Kanner. "The U.S. Conference of Catholic Bishops have said Ryan's budget fails the 'basic moral test' of helping the poor and vulnerable, and one expert even said that it could represent the biggest redistribution of wealth from the poor to rich in U.S history. The American people understand that Mitt Romney would take us back, and no change in rhetoric in the campaign's final weeks can change that." The speech also drew criticism from James Salt, who heads the non-profit Catholics United. "Unfortunately for all of us, when reality meets his rhetoric, Rep. Ryan is shown to have no credibility when it comes to caring about the least among us," he said in a statement. "It's clear Rep. Ryan needs to seriously examine what his faith teaches about serving those on the margins when the swing state cameras aren't rolling. It's important to remember the budget proposals he wrote in Washington cynically cut major funding to the very institutions he visits and claims are vital to protecting the powerless." Ryan had no shortage of criticism for the Obama administration. Returning to a campaign theme Republicans highlighted at the end of the summer, he criticized the administration for a proposal to give states more flexibility in meeting work mandates of the welfare law. Ryan left the campaign trail to go to Washington in late September to join House Republicans in voting to block the change. Ryan also revived criticism of the Health and Human Services Department for mandating that some Catholic institutions provide contraception coverage in their insurance policies, which has been met with outrage by the religious right. 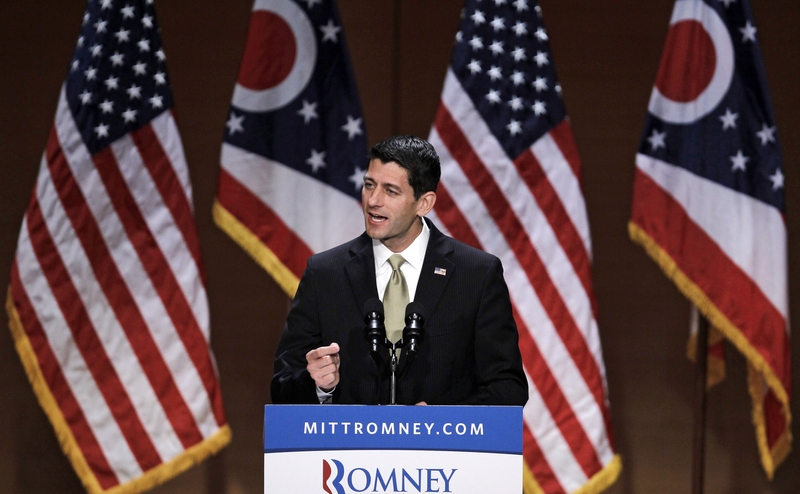 Ryan said that the mandate would be "gone" under a Romney presidency, a comment that brought him a standing ovation. School choice is another vehicle for lifting people out of poverty, Ryan said, citing the disproportionate percentage of minority students who are defined as low-performing. "Sending your child to a great school should not be a privilege of the well-to-do," he said. Ryan made a rare public reference to Romney's Mormon faith, describing the nominee's decision to work as a lay pastor for his church, which led him to counseling people in Boston's inner-city neighborhoods. "He's a man who could easily have contented himself with giving donations to needy causes, but everyone who knows him will tell you that Mitt has always given his time and attention to those around him who are hurting," Ryan said. "Should we have the chance to serve, I want you to know this," he said. "Mitt Romney and I share your cause, and we will seek your counsel. We will remember your hospitality today, and it will be returned. The transformative power of your example will inform our approach to public policy."